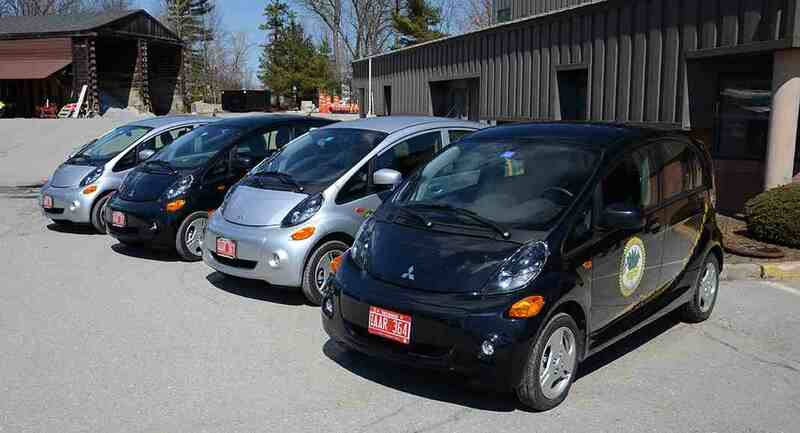 In 2014 the City of Winooski purchased four all-electric vehicles for their fleet. Vehicles that have the capability to be fueled by electricity are referred to as electric drive vehicles. These vehicles use electricity from a battery, either as their primary power source or as a supplementary source to improve fuel efficiency. These batteries can be recharged by being plugged into the electric grid or by electric generated features in the car such as regenerative braking. Hybrid Electric Vehicles (HEVs): HEVs, such as the Toyota Prius, are primarily powered by an internal combustion engine and an electric motor that uses energy stored in a battery. The battery is charged through regenerative braking and by the internal combustion engine and is not plugged in to charge. Plug-In Hybrid Electric Vehicles (PHEVs): PHEVs, such as the Chevy Volt, are powered by an internal combustion engine and an electric motor that uses energy stored in a battery. The vehicle can be plugged into an electric power source to charge the battery as well. All-Electric Vehicles (EVs): EVs, such as the Nissan Leaf, use a battery to store the electric energy that powers the motor. EV batteries are charged by plugging the vehicle into an electric power source. What are the benefits of electric drive vehicles? For the most part, electric drive vehicles produce fewer emissions than traditional petroleum fueled vehicles. HEVs produce tailpipe emissions but in general have much higher fuel economy levels than conventional vehicles and thus produce fewer emissions. PHEVs produce emissions when they are running off their engines and none when they operate off their batteries and EVs produce no tailpipe emissions. When evaluating emissions from any type of electric drive vehicle, it is important to consider the source of electricity. The technical name for electric vehicle charging stations is electric vehicle supply equipment (EVSE). These charging stations are built into the EV charging standard for electrical safety; first for the user, then the vehicle, and then the power grid. The primary function of the EVSE is as electrical safety equipment. A standard home charging station, whether it is a Level 1 (120V) station or a Level 2 (240V) station, will provide AC power to the vehicle for charging. The vehicle will convert this AC power to DC power and utilize that to recharge the batteries; the actual charger is on-board the vehicle. DC fast-charging EVSE (480V AC input to the EVSE) enables rapid charging at sites and is ideal for heavy traffic corridors and public fueling stations. A DC fast charger can add 60 to 80 miles of range to a PEV in 20 minutes. An EVSE implements several layers of redundant safety features to protect the user from potential electrical hazards while connecting and disconnecting the station to the vehicle for charging. Once connected to the vehicle, the station will inform the vehicle that power is available and at what level. From that point the vehicle takes over, initiates, and takes full control of the power transfer, unless an electrical fault occurs, in which case the station will stop the power transfer immediately. For a list of available charging stations, click here. Drive Electric Vermont is a statewide coalition of policy makers, industry leaders, and ordinary citizens dedicated to promoting the spread of electric transportation in the State. Find a vehicle comparision guide of EVs sold in Vermont, EV related events, and more on their website. The AFDC Alternative Fueling Station Locator can help you find public electric vehicle charging stations. Currently, there are 129 public EVSEs in Vermont. This number is constantly increasing, so it is important to check the AFDC Alternative Fueling Station Locator for the most up-to-date map. Drive Change. Drive Electric. represents a unique public-private partnership between auto manufacturers and Northeast states to advance consumer awareness, understanding, consideration and adoption of electric cars. Visit their website to explore interactive driver stories showcasing how EVs can fit your lifestyle and while learning the facts. 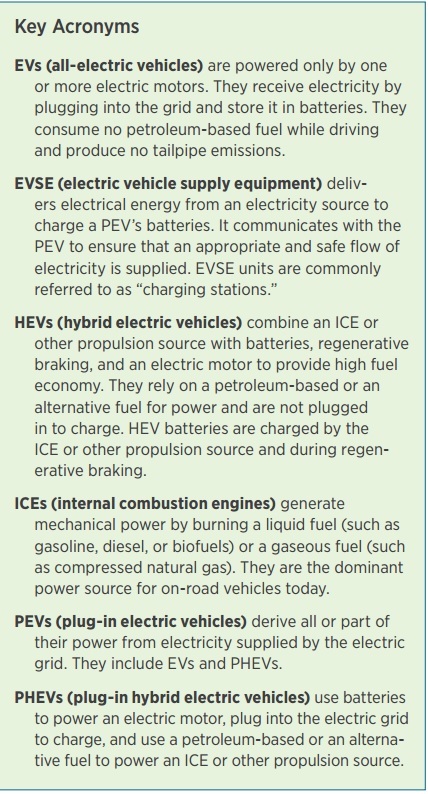 EVs in Fleets: This one-page document serves as a quick overview of EVs, EVSEs, associated costs and considerations. 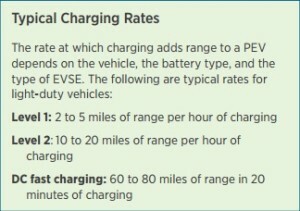 The Electric Vehicle Charger Selection Guide from the California Energy Commission (CEC) is designed to help site hosts and others learn about, evaluate and compare the features of EV charging equipment (available as of January, 2018 to assist them in selecting a charger for their application.